The first day of summer is June 20, bringing with it a season of outdoor barbecues, long lazy afternoons and lots of sunshine. But as the temperatures increase, we know homeowners turn up their air conditioners to stay cool and comfortable and that leads to an unfortunate result: high electric bills. Avoiding this seasonal financial squeeze isn’t always as simple as trying to use less electricity. U.S. residential electric rates are expected to be 2.4 percent higher this year than last year.1 So depending on where you live and how well you’ve learned to conserve electricity — with upgrades such as LED lightbulbs and energy efficient appliances — this year you may still pay more to your utility company. So how can you keep your home and budget comfortable in summer? A SunPower® home solar system is a solution that can enable you to generate your own clean, renewable energy to power your home during the heat of summer and all year long. Ann beats the Long Island heat and humidity with seamless solar on her Victorian-style home (pictured at top). Q: When did you go solar and why? We turned our system on in January 2015. We’re very energy conscious people, and we’ve been this way since the 1970s. I grow my own veggies, and we wanted to generate our own electricity. We actually tried to go solar in 2011, but there were too many trees shading our roof. Hurricane Sandy hit in 2012 and moved those trees for us. We were able to recover some income tax losses due to the storm and used that to go solar. Q: Has solar had an impact on your electricity bills? Yes definitely. The moment you turn on your system, your meter starts going backwards! Our electricity bill is usually just for the connection fee (about 10 dollars). In 2015, I paid $160 over the connection charges and $86 in 2016. Q: What time of year do you save the most on energy costs? From about mid-March through June, our system produces as much or more energy than we use. As it gets hotter in the summer, that goes down, and we may use more than we produce. We’ve had as much as 750 kilowatt hours in credit going into winter and wound up with small refunds throughout the year. Q: What do you do with your electric bill savings? I put the extra money in my Christmas fund. This year, we’re going on a cruise to Alaska. Outside of that, it’s just nice to know that with my husband retired we won’t have a rising electricity bill. Q: What’s your favorite part about SunPower's EnergyLink® monitoring software? I look at that app every day. I like seeing how much carbon I’m taking out of the atmosphere. It makes me feel good. In the heat of the California desert, Rick makes the sun work to keep his beautiful modern home an oasis of cool temperatures. My system went online in November 2014. I decided to go solar after I moved from Washington, D.C., to California and got my first electric bill for $650. I couldn’t believe it. As a retiree, I couldn’t afford bills like that. I was in sticker shock, and I knew I had to do something. I live out in the desert where we get about 360 days of sun, with summertime temperatures rising above 110 degrees, so why not use the sun to cool my home? (By about 2019) I should recoup the cost of the system. When the temperatures are lower during January through April, my solar system is producing more energy than I’m using. The extra energy goes into the grid, and I get a credit on my bill. In the summer, I’m using a bit more energy than I’m generating, so it all evens out. Q: How big is your house? My home is 2,500 square feet and spans two stories. 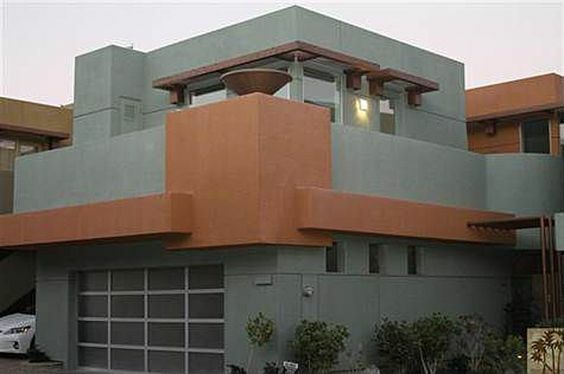 Usually, it’s just me and Roxy (my Chiweenie rescue), but I also have a casita (for guests) over the garage. Because not all of my home needs to be cooled all of the time, my house has three cooling zones, and I can control the temperature in each of the zones. When I met with my solar contractor, we worked through how much kilowatt capacity I’d need for my entire home and came up with a system with 30 rooftop panels. Q: Do you have a wireless or programmable thermostat? Yes, I installed Honeywell wifi-enabled thermostats. When I’m traveling I can control the temperature wherever I’m at. I can keep it comfy for Roxy and the pet sitter, and I can turn the AC on from the airport, so it’s nice and cool when I come home. My thermostats also connect to Amazon Echo, so I can tell Alexa to raise or lower the temperature! Q: What do you do with your summer utility bill savings? I love to travel, so my savings helps me go on trips. Last month, I was with my family in Cancun. In upstate New York, Gregory generates enough energy to keep his 1960s ranch-style home running through all year long. We turned on our system on June 30, 2016. We’re environmentally conscious people, and we wanted to take some action. Financially it made sense, too. The system should pay for itself in seven to 10 years, and we thought it would be nice to eventually go into retirement with no electric bills. All in all, it’s a no-brainer. Q: Has solar made an impact on your electricity bills? Yes, we are 100 percent covered. We still have to pay $17 per month for net metering, which allows us to use electricity from the grid at night. Our electricity meter runs backward when our system produces energy (giving us energy credits) and forward at night when we’re consuming energy but not producing it. We generate the most energy in the spring and fall, and what we don’t consume stays on our meter. Then we use that energy credit when we need more electricity in the summer and winter. This March our meter reset at zero, and so far, we’ve banked about 700 kilowatt hours for summer that we’ll use when we start using our AC to cool the house. Q: What kind of solar system do you have? 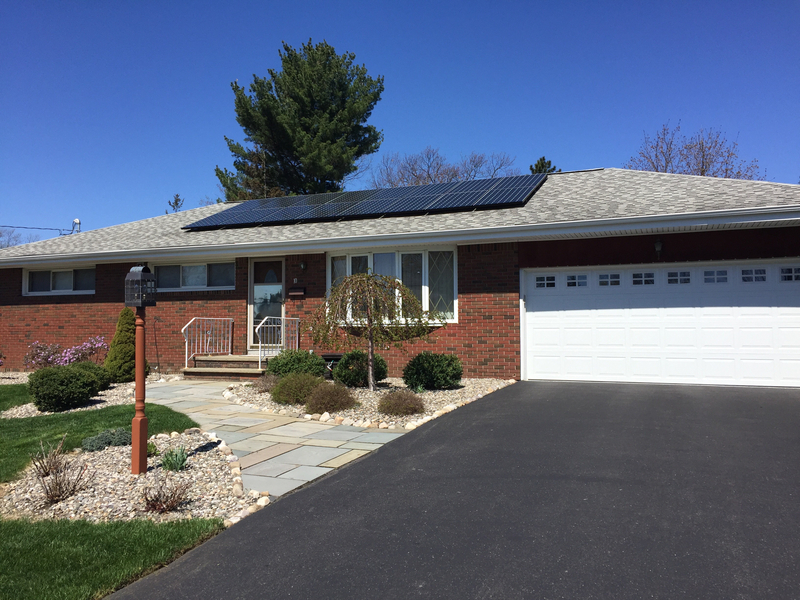 We have 5.2 kilowatt SunPower® Equinox™ system, the first one in Albany, with 16 E-20 Series panels. It only takes up a small portion of our roof, and everything is hidden, all the wiring, inverters and things like that. On the side of the house we have the net meter box from the utility company and downstairs in the basement is the SunPower control box for the monitoring software. If I had gone with a competitor, I would have needed 20 panels that were larger than SunPower’s, plus a bunch of ugly wiring on my roof and sides of my house and extra hardware near the meter. The Equinox system is nice and clean. We have a 1,250-square-foot home. It’s a ranch-style brick house that was built in 1960. The walls are not well-insulated, so we do have double-pane windows. Our utilities are on the low side, and right now we’re producing about 140 percent of our energy needs with our solar system. I have plans to switch my hot water heater and furnace to electric, so we can use more of our energy. And in the next five years, I plan to get an electric car. I’ve got plenty of roof space left, so I can just add additional panels to charge the car. Learn more at SunPower.com. Sign up for a free home solar evaluation or call us 1-800-786-7693. Click to find a SunPower residential dealer near you. 2 Customer savings vary depending upon a number of factors including (but not limited to) the following: equipment used, system size, system orientation and shading, insolation available, applicability utility rates and rate structure, as well as customer’s eligibility for rebates, incentives, and net-metering or similar programs (the availability of which may differ for each customer). 3 Tax credits subject to change. SunPower does not warrant, guarantee or otherwise advise its partners or customers about specific tax outcomes. Consult your tax advisor regarding the solar tax credit and how it applies to your specific circumstances. Please visit the dsireusa.org website for detailed solar policy information.